While this is too late for the Rare and Endangered topic challenge, it was inspired by it. I had to take a break from Puzzling for a bit, so I missed some really fun looking challenges, but now I'm back and ready to keep making and solving puzzles. Enjoy! As a reward for all of his contributions to the land of PacMania, PacMan has been knighted, and is now Sir PacMan. Ghosts are always afraid of him, so he no longer needs "power pellets" to take them on. He can now jump over walls, though he can't land on or in them. He must now move like a chess knight. His first trial as a knight is to collect as many pellets as possible from the map below. All pellets and walls are arranged on a square 21x21 grid. 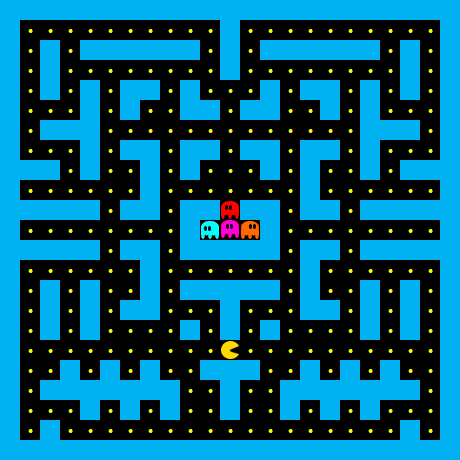 There are no pellets underneath the ghost's starting positions, but Sir PacMan can still enter those squares. He is also allowed to backtrack if necessary. The total number of pellets Sir PacMan can potentially reach. An argument showing that he can reach those pellets*. (If possible) tiles that the ghosts can hide on to be safe from Sir PacMan. Other than searching for positions in part 3, the ghosts can be ignored. *While this could be an exact path that reaches all possible pellets, it doesn't have to be. Be creative while still being convincing! There are some unreachable pellets, and there are safe squares for the ghosts. Sir PacMan can reach all but four of the pellets, I have marked the unreachable ones in green. He can't reach them because he would have to jump from one of the white (ghostly marked) squares, which would require him jumping from an unreachable border position. Every other square is reachable (proof by exhaustive checking of each square), including the ghosts' starting squares. So the only safe places four them would be the four green squares. I believe that if the ghosts can move first then they can always reach the safe squares (or at least avoid being eaten by moving to a square of the same chess-board parity as the square that Sir Pacman is currently on). 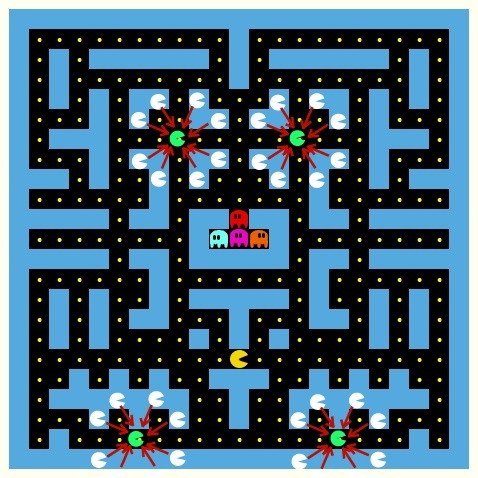 If Sir PacMan moved first he could potentially eat one ghost (with perfect play from both sides) if each ghost is required to move on each turn. Not the answer you're looking for? Browse other questions tagged video-games knight-moves or ask your own question.